Karen Schultz sent me this Obituary-Obituary for my 2nd great-grandfather clipped from the Perth Courier, June 13, 1913. I thought it was very important and should be documented. Thank you Karen! 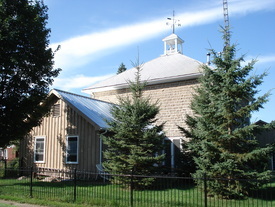 Public school Burritts Rapids–In 1793, Stephen and Daniel Burritt, from Arlington, Vermont, settled in the vicinity of the area now known as Burritt’s Rapids. A plaque was erected by the Ontario Archaeological and Historic Sites Board commemorating the founding of Burritt’s Rapids. By 1812, Burritts Rapids had become a bustling hamlet. At the peak of its prosperity, it had telegraphic and daily mail, 2 general stores, a bakery, a millinery shop, 2 shoe shops, a tin and stove store, a grist mill, a woolen mill, a tannery, 3 blacksmith shops, 3 wagon shops, a cabinet shop, 2 churches, 2 schools, 2 hotels, a bank and an Orange Lodge. The hamlet’s natural advantages as a transportation centre were enhanced by the opening of the Rideau Canal in 1831. Burritts Rapids was the site of the first bridge across the Rideau River. A post office was opened in 1839. Unfortunately, the hamlet was by-passed by the railway, and its importance gradually diminished with the decline of the canal as a means of transportation. Burritts Rapids was home to the Rideau Correctional and Treatment Centre from 1947 until its closure in 2004. It was subsequently demolished in 2013. Public high school students in this area go to South Carleton High School in Richmond. I am in receipt of your favour enclosing a statement of Accounts and as it differs so much from my expectations that I think it better to let it stand until I come down. We are new comfortably situated at Burritts Rapids at least as much as we could be expected. Mary Ann as well as myself is delighted with the exchange, the Mill is in good order and is doing well, I have done mere Business since I opened my new goods here than I would have done in 6 months in Kilmarnock, every person appears to be holding out encouragement to me. I think there is no doubt but that there will be a village start up at once. People seem to be quite encouraged to think that I have obtained the Water Privilege from Government — Major Bolton told me in Bytown yesterday that they never would have given a Lease of the waters to Smyth and appeared to be quite pleased with the exchange. Smyth has been very arbitrary with the Government officers and Put them defiant which course will never answer with these big Gentlemen. I have taken quite a different course. I have used all the fine speeches and soft sodder that I could think of and by that means have gotten the thing settled to my satisfaction. I am Putting me up a house near the Mill – 20 by 50 ft, as shop and a dwelling. I expect to get into it this fall. I was Much pleased at receiving a letter from Father, and shall endeavour to answer it shortly, I should be glad to have him see Mr. Alec McLean soon respecting the Balance of that devised sess? Roll. Mr. Pringle has written to me saying that it was placed into his hands for Collection I wrote to father stating the Terms that I should like to conform to, and would like to have him call on Pringle and state the thing to him as I am afraid that he will put me to cost. These young Lawyers are fond of employment. We shall expect some of you up this summer. The roads are much better to where we live now than where we lived before. Turn at Johnstown and inquire for Kemptville and then you are only 9 Miles from my Mill. Mother and Noriah might drive themselves out — or if they come as far as Prescott in the Boat, I would send for them at anytime. l may be down in a short time and Perhaps not until Fall. I have been expecting the Miller up for these some days Past- and should be very glad to have him come as soon as possible . I should not however be willing to pay him the salary he asks. I think it much too big but would be willing to Pay any reasonable Price if you Thought he Would answer – I would not value a few Dollar if I could get a Person that was a competent Hand and he would give satisfaction, I am very anxious that he would come up and would be Willing to Pay Part of his expenses, providing he did not agree,— if Possible write me by return of Mail if Nickleson will be up or net – I must look out for another immediately. Little Albert is getting a little better Poor little fellow he has had a hard time of it. Father states that the crops are looking well and he thinks that there will be something besides cordwood to be seen in Cornwall market next winter. I hope Norah and her little ones are doing well. By 1812, Burritts Rapids had become a bustling hamlet. At the peak of its prosperity, it had telegraphic and daily mail, 2 general stores, a bakery, a millinery shop, 2 shoe shops, a tin and stove store, a grist mill, a woolen mill, a tannery, 3 blacksmith shops, 3 wagon shops, a cabinet shop, 2 churches, 2 schools, 2 hotels, a bank and an Orange Lodge.4385-01 John PATTERSON, 30, cheese maker, Sarnia, Manotick, s/o Benjamin PATTERSON & Sarah Ann KIDD, married Tena McCORKELL, 20, Osgoode, same, d/o James McCORKELL & Bella FINDLEY, witn: William PATTERSON of Burritts Rapids & Nellie DAVIDSON of Manotick, 12 June 1901 at Brays Crossing. HISTORYFrom Rideau info.comBurritts Rapids was one of the first settlements on the Rideau, predating the Canal itself. In 1793, Colonel Stephen Burritt, floated down this section of the Rideau River on a raft looking for a good spot to settle. At Burritts Rapids he saw the water power potential for a mill and settled there with his wife Martha (Stevens) and their two-year old son Henry. Their second son, Edmund, was born here on 8 Dec 1793. The story goes that, soon after settling there, they were dying from a fever when they were rescued by a band of local Indians, nursed back to health, and even had their crops harvested for them. Ever after, the Burritt home was a welcoming place for Indians travelling the Rideau. When Colonel By came through in 1826, Burritts Rapids was a thriving village with several businesses. The first townsite was laid out in 1830 and a post office, with the name “Burritt’s Rapids” was established in 1839. In the 20th century, the name was changed to “Burritts Rapids” and today, both the community and lockstation are known by that name. The village, like the Rideau Canal itself, lost its commercial importance at the start of the 20th century. The fixed bridge at the north end of town (over the original Rideau River) is in the location where one of the earliest bridges across the Rideau was built in 1824 (it has since been rebuilt at least twice, in 1920 and 1983). Just upstream of that bridge a mill dam was erected (as early as 1845). It crossed the entire channel, with a waste weir at the south end and served a saw mill and a grist mill (both located on the south side of the river). The remains of this dam can still be seen today. In about 1832, a timber high level fixed bridge was constructed across the channel of the canal (south end of town), just upstream of the present day swing bridge. By the early 1850s, it had been replaced by a timber swing bridge in the location of the present steel truss swing bridge (which dates to 1897). The swing bridge is opened by turning a crank in the pivot at one end of the bridge. Counter weights and a set of roller wheels mounted on a circular track underneath allow the bridge to be swung with little effort. To the north of island, on County Rd 2 (Donnelly Drive) is the historic Christ Church, one of the earliest churches on the Rideau. An Anglican congregation had been formed in about 1822, but had no fixed place of worship. In 1830 Daniel Burritt donated land for a church and a burying ground. Construction was started in 1831 and completed in 1832. In 1834 the church was consecrated as Christ Church by the Right Reverend Charles James Stewart, Bishop of Quebec. Did Anyone Find the Lost Barrel of Silver Coins That Lies at the Bottom of the Rideau Canal? Did You Know about the Tay Canal Works Explosion? What Was Smiths Falls Perth and Port Elmsley like to Joseph and Jane Weekes? Opinicon Lake is a lake in South Frontenac, Frontenac County and Rideau Lakes, United Counties of Leeds and Grenville in Eastern Ontario, Canada.This shallow lake was formed when Colonel John By built the Rideau Canal. It also is part of the Great Lakes Basin. A barrel of silver dollars is said to still lie on the bed of Opinicon Lake, not far from Chaffeys Locks. Destined to pay the workers on the Rideau Canal, it was dumped overboard by the crew of the payboat off Barrel Point in 1835, when the ship was attacked by pirates. Shots were fired. The boat crew tried their best to defend the silver, but they knew that they would not be able to hold off the ambush. Knowing they were outnumbered, they dumped the barrel overboard so the pirates couldn’t get it. Foiled, the pirates left. The pirates didn’t bother returning, not wanting to take a dip in the lake. When the crew went back to spot where they dumped the barrel, they couldn’t find anything – neither a barrel or any trace of silver coins. The crew believed the silver was lost forever; however, many people today still think the silver is still lying somewhere on the bottom of the Rideau Canal. The silver remains lost forever. There is also the strange disappearance of one Samuel Poole of Lake Opinicon who went missing in 1885 and the apparently large sum of money he was carrying. According to Tales of the Rideau Canal- two more men vanished–Tom Dennison and Joe Ledway also disappeared from the same area. Do their ghosts still haunt Opinicon Lake? No trace of man or money was ever found. There is a tale told at Chaffeys Locks of a ghostly apparition on Opinicon Lake, a solitary paddler in a dugout canoe, the ghost of Old Davy Davidson. Shortly after the canal was built, a man by the name of David Davidson arrived in the area, building a cabin at the far end of Opinicon Lake. He made his living as a trapper, fisherman and hunter. Although he only made a modest living, rumours circulated that he had a nest-egg stashed away. By the 1880s, old Davy was a fixture on the lake. In that era, the area was overrun by pack peddlers – men who walked the trails and/or travelled along the canal by boat, stopping at every settlement to sell their wares. It was later rumoured that one of these peddlers got wind of the money Davy was reputed to have hidden near his cabin. The last person to have seen Davidson was a neighbour from across the lake, a fellow by the name of Thompson. Davidson had come over and visited him in late November. Thompson says that in the days following the visit he hadn’t seen Davidson. A week passed and Thompson became worried, there was no smoke from Davidson’s cabin and no sign of Davidson himself. It had turned cold, there was now ice on the lake, so Thompson had to walk around the lake to get to Davidson’s cabin. Thompson stopped at the house of another neighbour, a fellow named Buck. After explaining what he was up to, Buck agreed to accompany Thompson, and the two men continued on to Davidson’s cabin. There was a light covering of snow on the ground, but when they got to Davidson’s cabin there was no sign of any footprints other than the ones Thompson and Buck were making. Davidson’s dog was at the door. Thompson called the dog by name, and it allowed the men to approach the cabin. When they opened the door they were greeted with a grisly sight. Old Davy was dead, tied to a chair, his head beaten in, his face slashed. Davidson’s dog ran into the cabin and wouldn’t let the two men approach old Davy’s body. So the men retreated, heading off to get help. They returned a few hours later, after dark, with several men and boys carrying lanterns. One of the young lads knew the dog well and had come prepared with a haunch of venison. He coaxed the starving dog outside and tied it up. The men then entered the cabin. It was a horrifying scene that greeted them. There was blood everywhere in the cabin. Someone had gone to a lot of effort to try to get old Davy to divulge the location of his horde. He had been beaten, burned with hot poker and strangled. Some of the men had to leave when they looked down to see that the killer had even nailed Davy’s feet to the floor. The cabin itself had been torn apart. The trapdoor to the store room above the ceiling was open. The cupboards were all opened, drawers pulled out and the contents strewn all over the floor. The mattress had been cut to shreds and even parts of the floor had been torn up. Several of the men stayed while others headed back to get the authorities. They returned the next day with the postmaster and county constable. The only conclusion that could be reached was that Davidson had been murdered by person or persons unknown. Although a pack peddler had been sighted in the area in about the presumed date of Davidson’s death, he was never found. Davidson had no known relatives and his worldly possessions were few, some traps and guns. So after a few weeks of fruitless investigation, the matter was dropped, the crime unsolved. People say he still haunts the area with his dog in his canoe looking for his stolen money. This poem was written by Captain “Ned” Fleming (1868-1953), one of the last steamboat captains of the Rideau, and a descendent of Chaffey’s first lockmaster. During his long career, he was captain of the Rideau Queen and Rideau King which operated between Kingston and Ottawa – running night and day. Captain “Ned” frequently put his thoughts into verse – in this case, inspired by Opinicon Lake at night. If a fairer lake you look for, you may well look in vain. Whose beauty fills the human heart with wonder and delight. In beauty shine today, as they did in days pristine. The indians ate them, liked them, and called the lake “Opinicon”. Without-paddle or oar to propel it, o’er the mistly moonlit tide. The one they say is the ghost of Thomas Dennison. And ’tis said that he labours still to bring the raft ashore. Perhaps he is joined by Joe Leway, who died in a mine near by. On the lake shore, where the frost king, closed his eyes in death. He went to Kingston, to get the pay, for lumber he had sawn. Next day he was seen to leave, for his home on Opinicon. From that day for many years, his fate was quite unknown. Some people thought, with the money, to other land held flown. Children one day found his bones, on the shore of the Opinicon. Full forty miles, where now he was but three miles from his home. An icy wind blew down the lake, a blizzard from the west. But he brushed the snow from an old log and with a sigh sat down. While he gathered strength to face that bitter wind again. As with benumbed hand, he rubbed his frosted face. Alas, it was the sleep of death, that knows no earthly waking. Where anxious hearts were waiting, for one who would never come. But they never knew that his bones lay on the shore of Opinicon. Where ‘neath a rock for hours he lay, with none to give him aid. And goes forth to join other spirits on Opinicon’s silvery tide. Tho’ at midnight, he may cross the lake with Leway and with Poole. Or he may have with him, Leway, who died beneath the stone. Will glide o’er the Opinicon, swiftly and silently. And they talk of things of long ago, on the lake they know so well. To wander o’er at the midnight hour, the lake they can’t forget. Reminders of a long forgotten day, why should they linger here? Like dead leaves drifting quietly from a long forgotten year. If at midnight you would listen, to the Ghosts of Opinicon. Poem courtesy The Lockmaster’s House Museum, Chaffey’s Lock. The Lost Island– Now You See it- Now You Don’t!